What is the GUI tool in the screen shot? Instruments is a pretty cool tool. As always – takes some time to really interpret the numbers. We use it for BlackRay development – btw, I use MacOS for (almost) the same reasons as you, looks nice and just works. 1. Moving many allocations to the heap instead of malloc. 2. Merging multiple allocations into one in several cases. 3. Better estimates of sizes needed for some allocations. 4. Defer allocation of upd_buff, of the size of the data row, that’s only needed if a row is updated. Those who have an Oracle MySQL support subscription can also watch its mirror bug 11764622 in that system. I asked for escalation of your patch for innodb_max_dirty_pages_pct and that’s been assigned to a developer. No ETA, just means it’s likely to get done sometime reasonably soon. Not guaranteed, of course. This isn’t the official position of Oracle corp; for that consult a PR person. Is there any howto for creating Xcode projects and using Xcode for not Mac/iOS software? 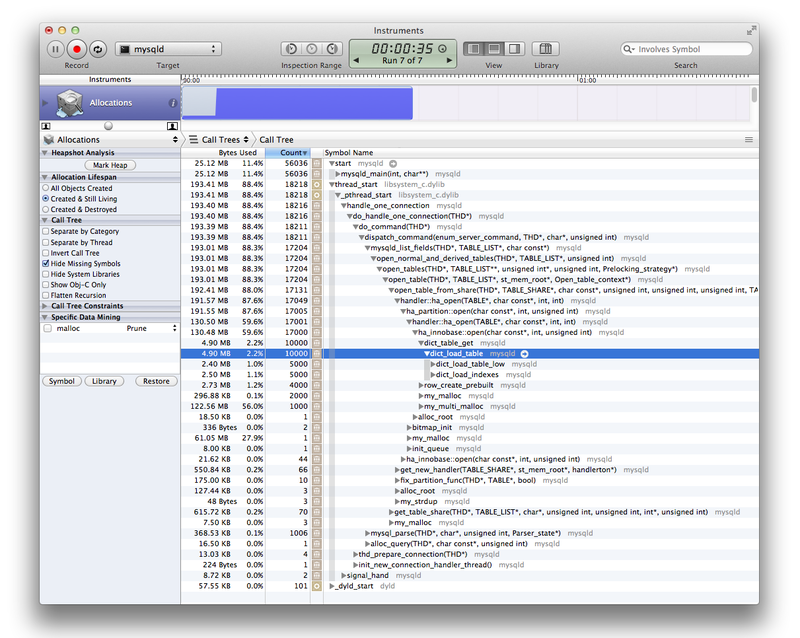 Can you, please, describe how are you debugging and profiling UNIX programs such as MySQL in XCode? Wasted a few hours on this today.